On Sunday January 15th, 2012, André appeared in the CBS Good Morning Show. 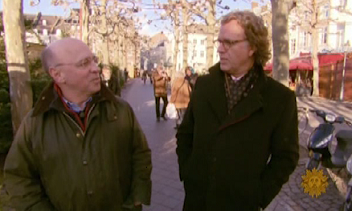 Presenter Richard Ross interviews André in his home-town Maastricht. Thanks to Jim and Ruth from California for sending us this program. "Shall we dance" by Richard Ross on André Rieu. Music as a mirror of life. André is the waltz king. Classical music for those who don't enjoy classical music. André was five when he picked up the violin. Twenty five years ago he formed a band based on Johann Strauss. He has formed over 30 albums. His tour group is just behind Lady Gaga and ahead of Justin Bieber. His show employs 120 people. André designs the gowns. "I want them to be happy on stage." An annual concert in Maastricht, Holland. The full scale replica of Vienna's palace. Impresario of musical fantasy. A Disneyland for grown-ups.